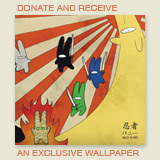 I’ve been a little demon this week updating the shop with new mech. 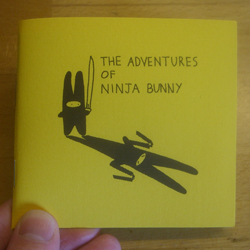 Firstly there’s Ninja Bunny’s third book Attack of the Clone..hmm I wonder what could have inspired that title? The book coincides with today’s comic strip which features a Hokusai style version of the story. 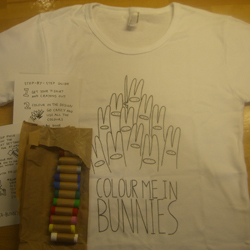 Ninja Bunny’s first t-shirt comes in the form of Colour me in Bunnies, a plain white tee with a black screen print design and 12 colourful fabric crayons to customise and colour to your hearts content. If you’re from the States you get the added benefit of getting funny looks for having ‘U’ in ‘color’. This is a limited run of tee’s so get them while they last. On an added note to those from outside the UK is that everything in the store is now a fair bit cheaper thanks to the fluctuation in the pound, who said recession is a bad thing?